As can be seen, reviewers all agreed that "The Lucky Devil" is a good picture. The New York Times' reviewer put things in perspective, though, by adding, "'The Lucky Devil' is not a great picture, but it is very good entertainment." Of course, the obvious comparisons were made to the earlier Wallace Reid pictures which were so enjoyable such as "The Roaring Road" (1919) and its sequel "Excuse My Dust" (1920) - a logical comparison considering the fact that Byron Morgan wrote the Reid pictures and "The Lucky Devil," as well. 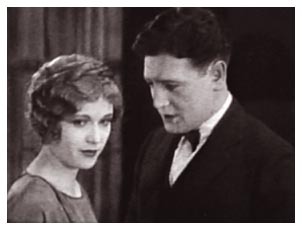 Fortunately, rather than being a tired rehash of previous picture, as one would expect when a theme is continued for a third, fourth or fifth time, "The Lucky Devil" and Dix's performance are refreshing and may even have an edge on Reid's earlier films. As the Harrison's Report reviewer pointed out, "It is . . . just as suspensive (sic), just as thrilling, as were the Reid stories and contains as many comedy situations, if not more. Mr. Dix impersonates the hero's role most happily; he imparts to the picture a light air, putting the spectator in a happy frame of mind all the time." In the case of "The Lucky Devil," Morgan gave an interesting and captivating premise that enhances the appeal of the story. Bill Phelps (Dix's character) wins a automobile described as a "hoodoo car," in other works, a car that is jinxed. The car is owned young Rudy Franklyn, whose father is by the owner of the Franklyn Department Store because it somehow seemed to keep in son in trouble with the law and/or women. He decided to give it to the Girl Scouts so they could raffle it - both father and son believing the car to be a "hoodoo." Telling a friend, "Gee! If owned this baby - I'd head for the real open spaces!" Bill spends is entire savings, $50, on raffle tickets and wins! 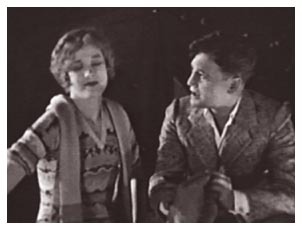 A neat love story is woven into the narrative with the beautiful and charming Esther Ralston as a would-be heiress, Doris Kent, traveling with her aunt - the indefatigable Edna Mae Oliver in a rare silent movie appearance. Oliver's comedic talents were a delight in her heyday during the 1930's, and she is no less delightful in this silent film. Doris has received a letter from her uncle stating that he wishes her to be the heiress of the Sedgmore estate and millions. She and her aunt have sold all they have to buy a Ford and travel to Nampa where the estate is located. Bill and Doris meet at a campground, but the suspicious aunt isn't as welcoming to the stranger as is her niece. As her introductory intertitle describes her, "Aunt Abbie Kent whose natural pessimism has not been dispelled by the prospect of an inheritance for her niece." This pessimism is apparently warranted when the Aunt Abbie finds a newspaper article about Rudy Franklyn's recent troubles accompanied by a photo of the car. Recognizing the car as the same one Bill is driving, she convinces her niece that the stranger must be Rudy Franklyn and not someone with whom she should associate. Thus, the first instance of the car justifying it's "hoodoo" reputation. So, Doris and Aunt Abbie take off early the next morning before Bill awakes, and, of course, his first thought is that he must catch up to them. This, first of all, results in a speeding ticket. Then he has a flat tire, and, while he's changing the tire, a stranger on a bicycle comes along and steals his wallet - more evidence the car is a "hoodoo." One stroke of luck does occur, however. As Bill is pushing his car, he notices Doris and her Aunt stalled on the side of the road ahead. He convinces them to let him siphon gas from their car to his, and he can tow them to Nampa. Bad luck continues in Nampa - first for Doris and her Aunt as they find that the uncle has no estate and is an inmate in an insane asylum. Then, both Doris and Bill run up unpayable bills for their hotel rooms because both are broke. Bill runs across a way out to pay all their bills and make Doris feel as if she received an inheritance - the Annual Nampa Road Race has a top prize of $10,000! There's only one catch, the entrance fee is $100! But, as luck would have it (especially in the movie world! ), Bill finds a way to earn not just $100, but $200! At the local carnival, all he has to do is last two rounds with Sailor Sheldon, the Australian Light Heavyweight Champion. Actually, Dix and Gunboat Smith, who plays the part of Sailor Sheldon, put on a good performance in the ring. Nothing silly about this fight - a slugfest that is staged much better than most from this period. The ending is almost worthy of a "Rocky" movie as Bill is beat to a pulp (very realistic! ), but remains standing to win the prize. Morgan as the writer and director Frank Tuttle deserve credit for bringing in a few surprises in the film that keep things interesting. One of those is the return of the guy who stole Bill's wallet while he was changing a tire out on the road. Bill spots the old guy and gives chase. A cop sees them and follows. Behind the stores, the cop comes up just as Bill is ransacking the old guy's pockets for his wallet. He finds it, and standing there with his foot on the thief's chest, the cop assumes Bill is the bad guy. He orders Bill to give the wallet to the old guy - and to make matters worse, when he sees the $200 in Bill's hand, he makes him give that to the old man, too! More hoodoo? At any rate, Bill ends up entering the race, his entrance fee being paid (unbeknownst to Bill) by Doris. It's a spectacular race with great camera angles and some fancy driving - cars skidding around on the dirt roads, driving through flaming hay bales spread across the road - and no fake speeding up of the film to give the impression these old racers are going faster than they are - these guys are really flying! The only "faking" comes in the close-ups of Bill in the car, but that's as one would expect. Morgan added a few ingenious twists to his race story, though, that enhance the enjoyment of the race and help keep the viewer a little closer to the edge of the seat. For comedy, the old Constable insists he can't let Bill's car out of his sight because the landlady called and complained about Bill's unpaid bill at the hotel - so he rides with Bill in the race. "Gosh, I ain't had a thrill like this since my old woman bobbed her hair," he exclaims. Also, to add a little more excitement to the event, Morgan plants a couple of bad guys in the race who are known for running other racers off the road and using whatever unscrupulous means they can to win. Obviously, the end of the race comes down to a challenge between Bill and one of these guys. Of course, we know in these films that the hero always wins the race. . . but does he? Bill has a comfortable lead and is headed for an easy win when suddenly a small child walks out into the road. To avoid hitting the child, Bill runs off the road and hits a tree. The gears are stripped! Even though Bill has a huge lead - he has no choice but to just give up - that is, until the Constable suggests, "Try reverse!" Well, you know the rest . . . The copy of "The Lucky Devil" commented on here is from Grapevine Video, and it's one of those instances when a "plug" is necessary. I purchased this film from Grapevine Video on VHS several years ago. The quality of the print and the score were "OK" - I had no complaints. It was good enough, though, to rank as one of my many favorite silents - lots of fun to watch. 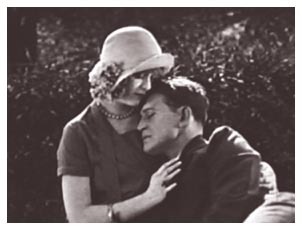 When Grapevine owner Jack Hardy went into a brief retirement a few years ago, he thankfully returned to continue offering rare films - although with a much-reduced catalog. "The Lucky Devil" was one of the titles missing. However, he recently brought this enjoyable film back - this time on DVD with a new, original organ score by David Knudtson. If you were one of the ones, along with me, who purchased the VHS version, toss it out and get this copy. The difference in the print alone is worth the few dollars - not to mention what Knudtson's excellent score adds to the enjoyment of the film. The quality is . . . well, would you rather have a hot dog or a full course meal? I think you get my point - not perfect sharpness, but good contrast, excellent blacks and whites, and head and shoulders better than the videotape copy. Kudos to Jack Hardy for this excellent quality release - so go ahead, upgrade your collection! Oh, and if you've never seen this one, spring for a few lousy bucks - you'll be glad you did. 1. Motion Picture. "The Lucky Devil" review. October 1925. 2. Picture Play. "The Lucky Devil" review. October 1925. 3. Harrison's Reports. "The Lucky Devil" review. July 11, 1925. 4. Variety. "The Lucky Devil review. July 8, 1925. 5. The New York Times. "The Lucky Devil" review. July 8, 1925. 9. Ralston, Esther. Some Day We'll Laugh. (The Scarecrow Press, Inc., Metuchen N.J. and London, 1985).